Early in my career in the field of Oriental Art, I studied and had an interest in the arts of Japan. Netsuke, woodblock prints and pottery held a natural interest for me. 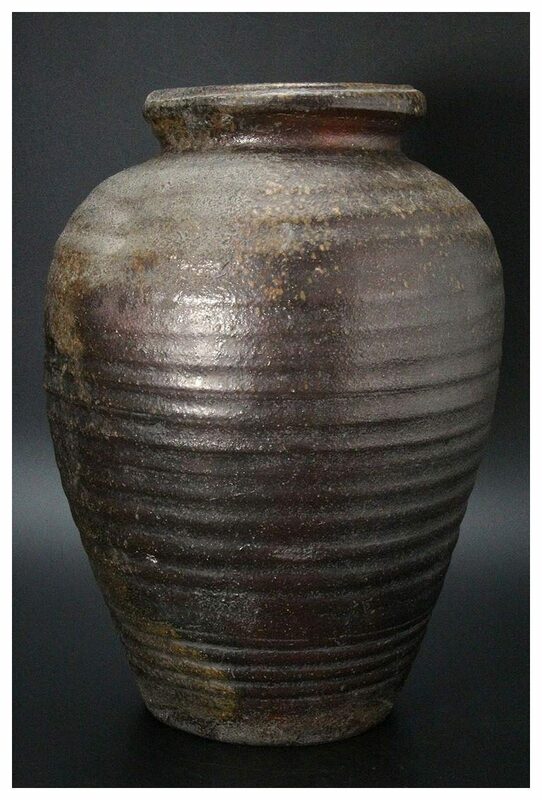 Recently, I was able to acquire several Muromachi Period (Jidai) (1336-1573) works of art. 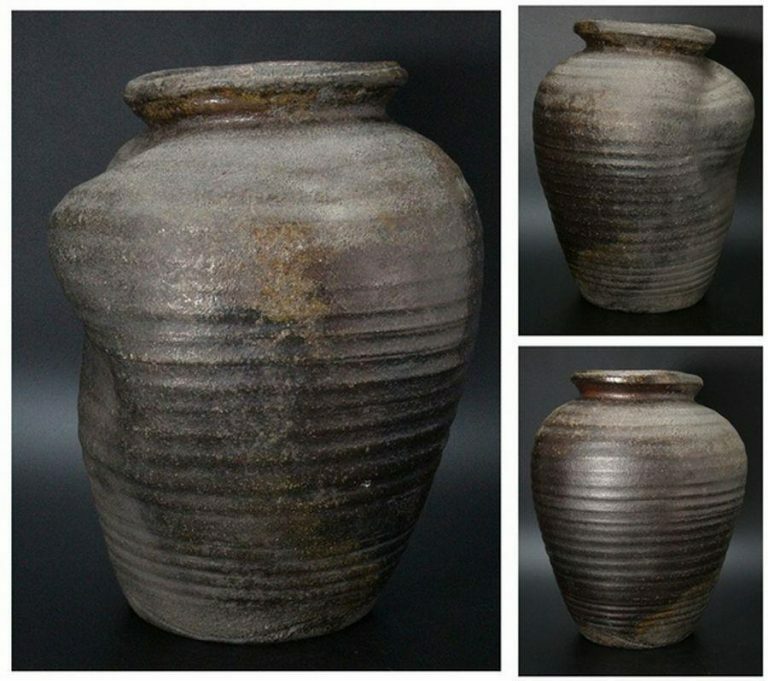 One, a superb bronze form Flower Vase, the other a Ko-Bizen Water pot of irregular shape. Both are from the Aoki Family and have provenance. 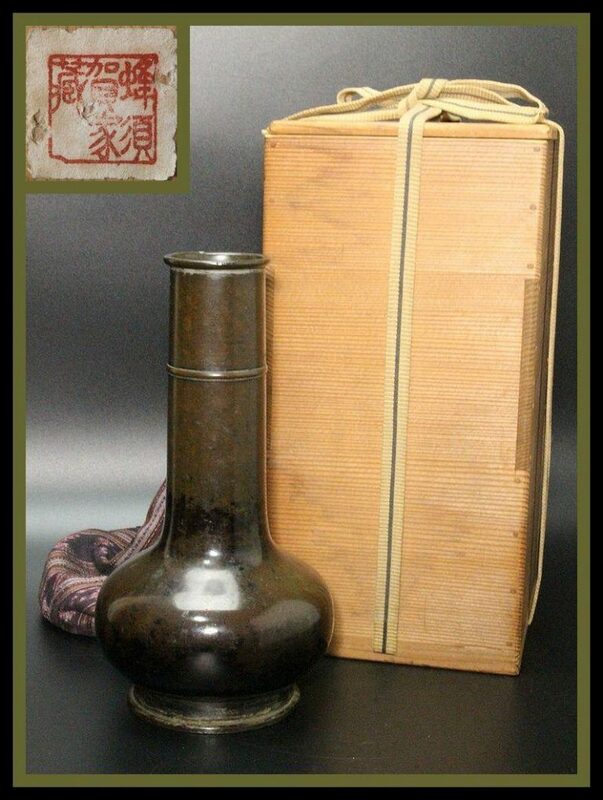 I am pleased to add these wonderful pieces to my personal collection of Tea Ceremony objects. It is an auspicious beginning for 2019. For a collector, there is nothing more satisfying than acquiring a work of art that “speaks” to you. These two objects are certainly doing that to me! Enjoy! On behalf of myself and the staff of S. Bernstein & Co., we wish all of our friends and clients a Happy Holiday Season! Stay warm, healthy and happy! May all your dreams and expectations come true. There is much to be thankful for this Thanksgiving. So much has been accomplished this past year. We look forward to the coming Holidays as a time to reflect and appreciate the simple pleasures which life has to offer us. This year’s lecture, Lunch with the Qianlong Emperor was a great success with all seats sold out several months before the October 6, 2018 date. There were attendees from Singapore, China, New York, Louisiana, Los Angeles, Pacific Grove and San Francisco. The Fairmont Hotel staff provided the California Room with state of the art audio visual equipment. The Laurel Court restaurant setting was elegant and the food and service by the Hotel staff prompt and attentive. Following lunch, the group returned to the meeting room to enjoy a special treat, the showing of a beautiful film by the National Palace Museum’s collection of The Emperor Qianlong’s collection of Treasure Boxes. I appreciate that the attendee’s made a big effort in terms of travel time and cost to attend my event. Thank you to all! My staff and I enjoyed it as much as you did! Safe journey home! I am pleased to recommend two volumes which I recently read which provide interesting background to the prevalence of Chinese art in America. 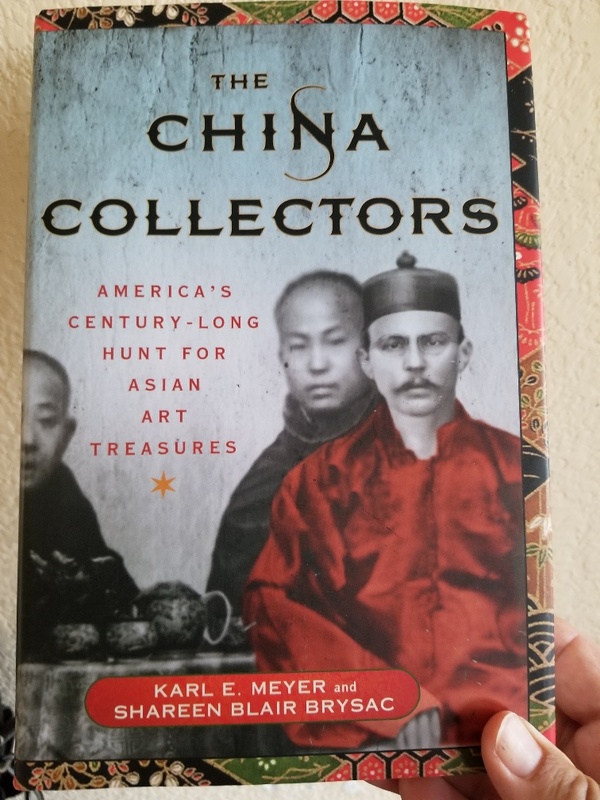 The first is The China Collectors- America’s Century Long Hunt for Asian Art Treasures by Karl Meyer and Shareen Blair Brysac, published by Palgrave Macmillan. This volume traces the earliest Americans who sought Asian art and helped to form collections. The volume continues through to Avery Brundage whose collection forms a significant part of the Asian Art Museum of San Francisco. Important dealers and their contributions are also covered in detail. I found this volume to be informative and entertaining. 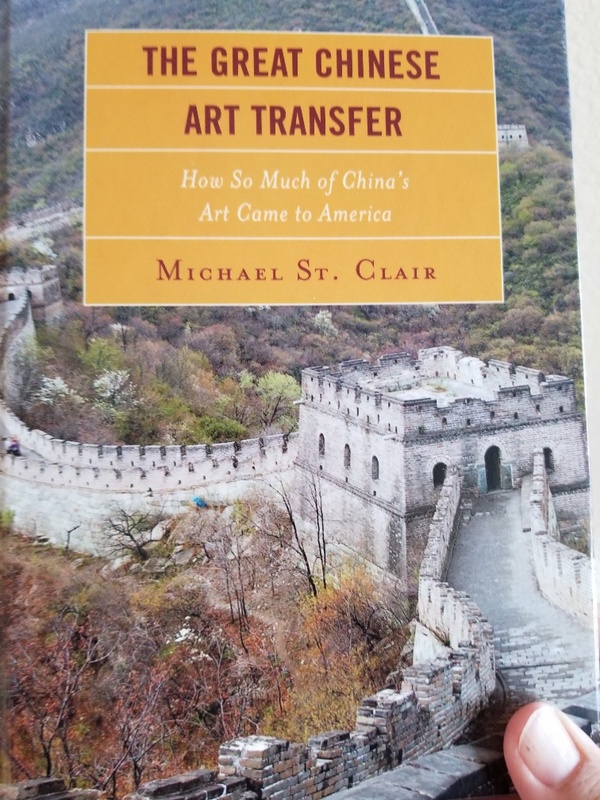 The second volume, The Great Chinese Art transfer- How So Much of China’s Art Came to America by Michael St. Clair was published last year by Fairleigh Dickenson University Press. This volume is written in an easy to read style but is somewhat marred by poor proof reading of the text. There are a number of errors which a good editor could have caught. This defect is balanced by an interesting well researched subject. The author shows real passion for his subject and it comes through in the text. Details about the former Imperial Collection are especially interesting. 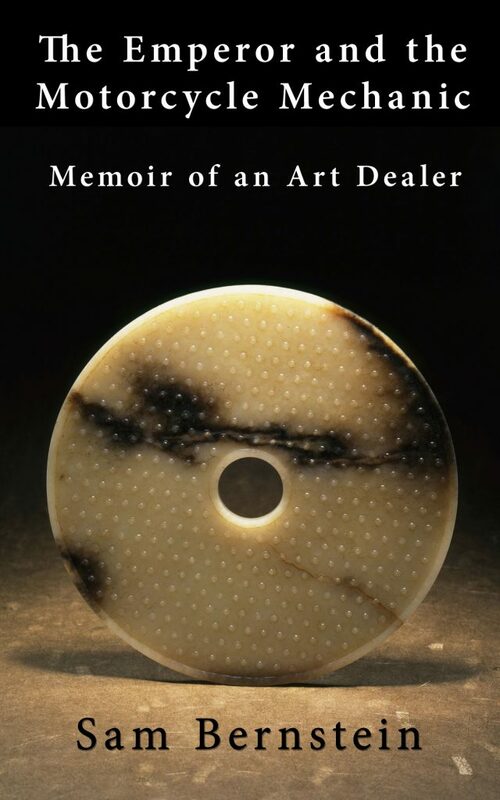 Taken together, these books document the rise and expansion of collecting Chinese art in America. I am certain the next volume dealing with the subject will document the movement of Asian art from America to Mainland China. That will be quite a story to tell! Rarely were jades collected by the Ming and Qing Emperors inscribed with Imperial marks. The remaining surviving pieces suggest that jades worked in the jade workshops for the Emperors sometimes were given marks. It is my opinion that most marks which appear on jades at auction are added to enhance the value and marketability of the piece. Some Emperors, especially the Qianlong Emperor, ordered comments or poems he was inspired to make to be inscribed on jades. 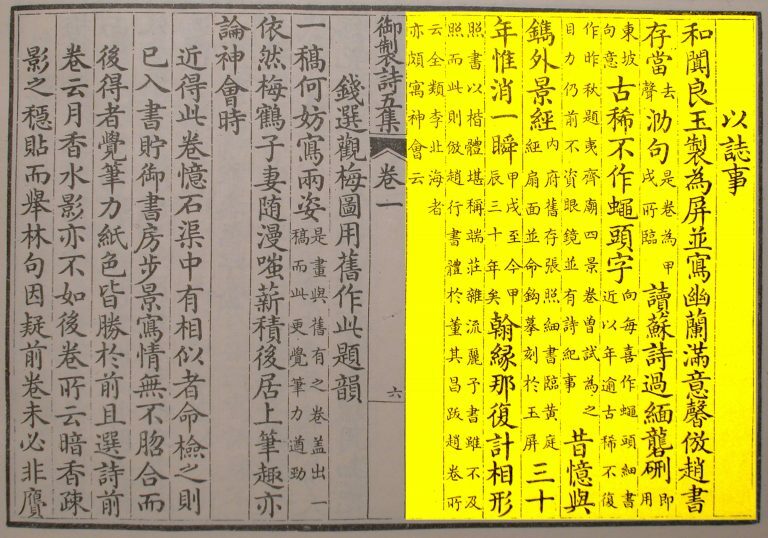 Inscriptions added with reign dates are sometimes to be found listed as individual pieces in the Qianlong archive, arranged by year. If there is no date on the jade piece, it is difficult to look up the piece in the archive which consists of approximately 10,000 pages. I have handled some of those and written articles about my experience hunting down such pieces. Class One: Jade pieces made specifically for an Emperor that have a date and are listed and described in the Imperial archive. Class Two: Jade pieces that have a historical provenance of Imperial ownership which is plausible. For example, jade pieces removed by Westerners from the Palaces during war time. Class Three: Jade pieces which have quality of subject matter, workmanship and material that may have been collected by an Emperor or made by the Imperial workshops. The presence of an imperial mark, in and of itself, does not mean anything and cannot be relied upon to prove or suggest actual Imperial ownership. The reason is that these are easily added by a seller to enhance the market value. Also, there is the Chinese practice of adding an Imperial mark to suggest that the piece is fine enough to represent an Imperial taste. 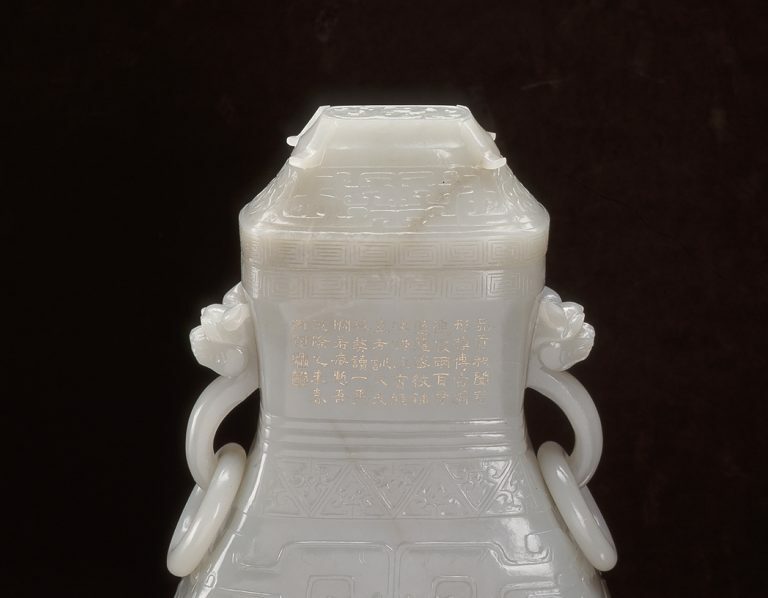 For example I have often encountered the inscription, Qianlong Fanggu or Emulating the Ancients placed on jade objects. It is my opinion that most if not all of the jades that come up at auction have added spurious Imperial marks. A collector should buy the quality of the workmanship and the difficulty of the subject matter together with beautiful material. Studying the remaining Imperial pieces in the National Palace Museum is important to learn the real taste of the various Emperors. 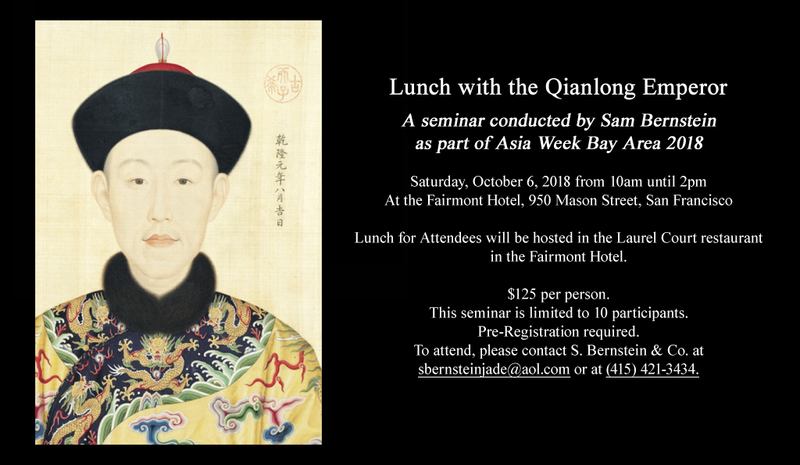 Lunch with the Qianlong Emperor on Saturday, October 6, 2018 here at the Fairmont Hotel in San Francisco. 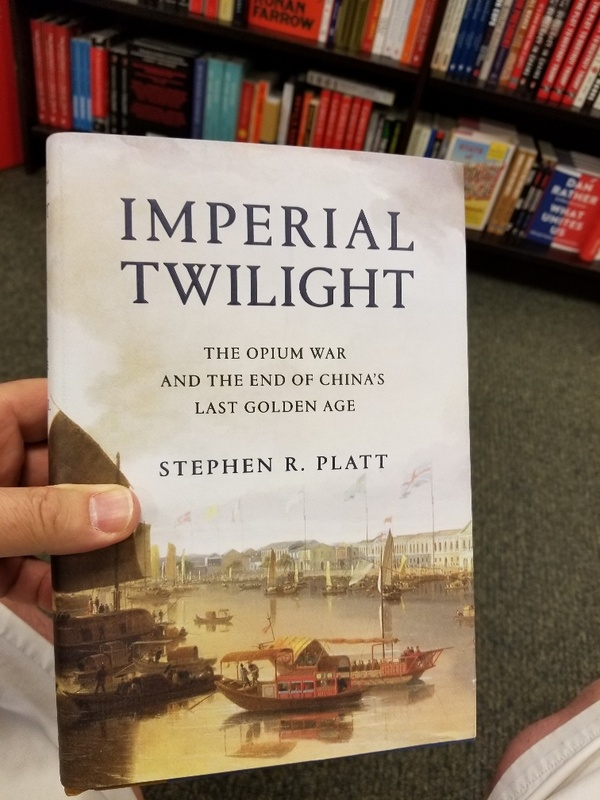 I highly recommend Stephen R. Platt’s new volume, Imperial Twilight, The Opium War and the End of China’s Last Golden Age, published by Knopf, 2018. The history of the relationship between China and the West has a bearing on current events. The collecting of objects of Imperial provenance was made possible by the results of the first and second Opium wars. The Western nations sacked the Summer Palace complex and the Forbidden City, bringing out thousands of objects which found their way into Western museums and private collections. My lecture, Lunch with the Qianlong Emperor on Saturday, October 6, 2018 will look at examples of jades which were formally in the Imperial Collection. I have reserved a larger lecture room here at the Fairmont to accomodate the larger number of attendees. Pre-registration is required. Contact me at sbernsteinjade@aol.com or call the gallery at 415-421-3434 to register. $125.00 per attendee, which includes lunch here at the Laurel Court Restaurant in the Fairmont. This Bronze mask of a Tiger made during the Eastern Zhou Period (770-255 BCE) is one of my favorite pieces in my exhibition, Treasures Fit for an Emperor. The Tiger is cast with mounting prongs on the reverse side so that it could be mounted on a bronze war helmet. The Tiger is a symbol of military prowess in Chinese culture. 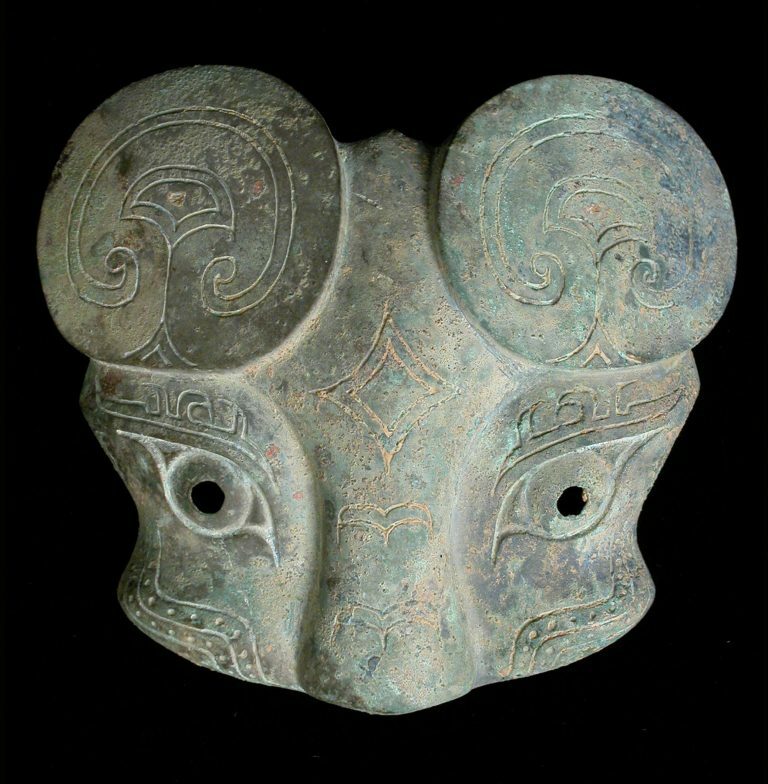 By the Eastern Zhou period the art of casting bronze was highly advanced. In addition to this mask, my exhibition has other precious bronze, silver and gold objects from China’s antiquity many of which have been published and illustrated. Come and enjoy! For those of you who will be attending my seminar Lunch with the Qianlong Emperor, here is a suggested reading list. Of course it is not required that you read these prior to the seminar. The object is to become informed and to have fun! the jade connoisseur. Most of these I have enjoyed reading and re-reading over the years. The Forbidden City. Geremie R. Barme. Harvard University Press, Cambridge, Mass. 2008. Don’t be fooled by the small size of this volume! It provides a well written account of the QL Emperor’s daily life within the Forbidden City. Very interesting and insightful. Chinese Jade, Stone for the Emperors. Barry Till & Paula Swart. Art Gallery of Greater Victoria. 1986. A well researched ands readable account of the chronology of jade worked from the neolithic through Qing Dynasty. There is an interesting chapter on Jade smuggling during the Qing Dynasty. The Last Emperors- A Social History of Qing Imperial Institutions. Evelyn S. Rawski. University of California Press. 1998. This account of the lives of the and organization of the Court is an enjoyable read! Just about anything written by Dr. Rawski is useful and informative. China’s Last Empire- The Great Qing. William T. Rowe. Harvard University Press. Cambridge, Mass. 2009. This volume is one of a series covering the vast history of China. Somewhat of the dry side of the literature about the Qing Court, there are flashes of interesting nuggets of useful information. Translucent World: Chinese Jade from the Forbidden City. Yang Liu, Edward Capon et al. Art Gallery of New South Wales, Sydney Australia. 2007. A well written, informative and attractive catalogue of a collection of Jades exhibited in 2007. Splendors of China’s Forbidden City- The Glorious Reign of Emperor Qianlong. Chuimei Ho & Bennet Bronson. The Field Museum. 2004. This is a lavishly produced catalogue for the Exhibition held in 2004. Informative and the objects chosen are representative of the QL Emperor’s Life style. Daily Life in the Forbidden City. Wan Yi Wang & lu Yanzhen. Viking Press. 1985. A difficult book to find. Authoritatively written account of the history of the Forbidden City with excellent photography. Buy it if you can find it! 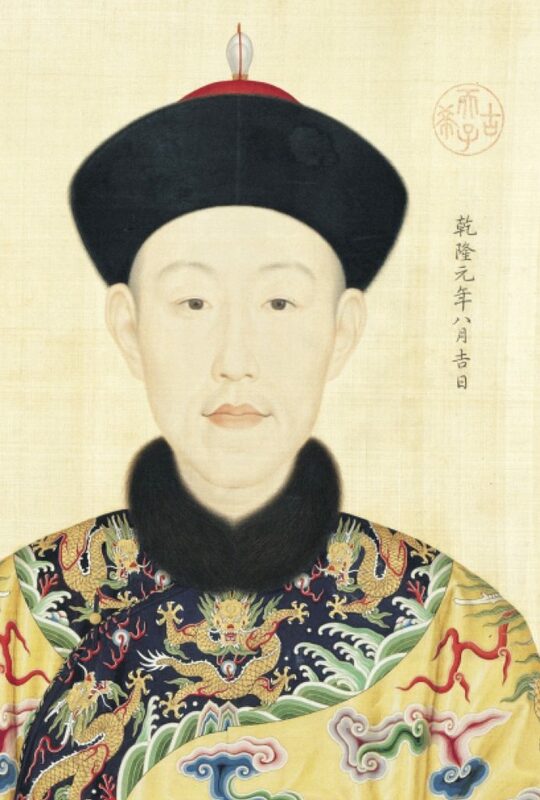 My interest in the Qianlong Emperor began more than forty years ago. When I was in my twenties, I read Jonathan Spence’s volume Kang-hsi-Self Portrait of the Kang-hsi Emperor and it captured my imagination. Legend says that one day Hongli as a young prince was hunting with his grandfather. A tiger appeared and attacked the hunting party. Hongli stood his ground bravely and showed no fear. The Kangxi Emperor was impressed and told the Yongzhong Emperor that this young prince should be his heir. As my at dealing career began, I was fortunate to handle a number of Imperial objects from the Qianlong Emperor’s collection that bore his poetry. His words revealed something of his character and philosophy of life. Eventually my research bore fruit and I wrote and published “In the Emperor’s Own Words”. The article is based on inscribed jades listed in the Imperial Archive which passed through my hands. This October 6, 2018 I will host a seminar devoted to examining jades from the Imperial collection which I have previously handled. Since this is a favorite area of interest for me, this will be a fun event. We will meet at ten am and break for a lunch in the Fairmont Hotel’s Laurel Court restaurant at around noontime. After lunch, we will return to our meeting room to finish the lecture. I have selected some great photography of Imperial Jade from the archive of S. Bernstein & Co. to share with the 10 lucky participants selected to attend. If you are interested, sign up now before it is sold out. I guess I am a late bloomer. I was 55 years old before I bought my first latte. I was curious about what all the fuss was about. Now, after completing my second memoir, The Emperor & the Motorcycle Mechanic after TEN YEARS writing, here is my first BLOG post. Hey, we put a man on the Moon. I can do this. First I want to that Ms. Aini Sanjaya, my assistant for joining S. Bernstein & Co. and finishing the company website. This after trying six candidates who as it turns out could not walk and chew gum at the same time. 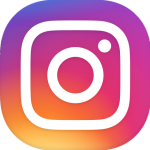 I hope to have something intelligent and informative to say in my next posting.